A surprising number of hard-core home improvers are afraid of soldering copper pipes. I even know a professional plumber who quietly confessed to me one day that he didn’t like the process, especially in the dusty basements of older homes. As he grew older he grew more and more fearful of setting someone’s house on fire. It’s sentiment like these that are behind Kitec, one of the latest types of solder-free water pipe. The fact that I like copper water supply pipe means that I’m not easily sold on alternatives. Copper is inexpensive, durable and not nearly as difficult to solder as reputation suggests. But after trying Kitec, I have to admit that it’s even easier to deal with. 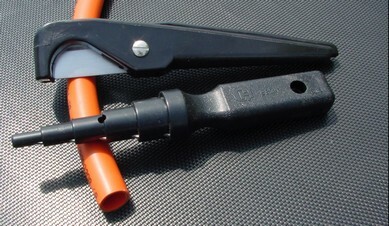 Connections can be made with either crimp-on or threaded fittings. And since the product is flexible, it reduces the need for fittings by 40% compared with rigid pipe, according to manufacturer claims that seem reasonable to me. 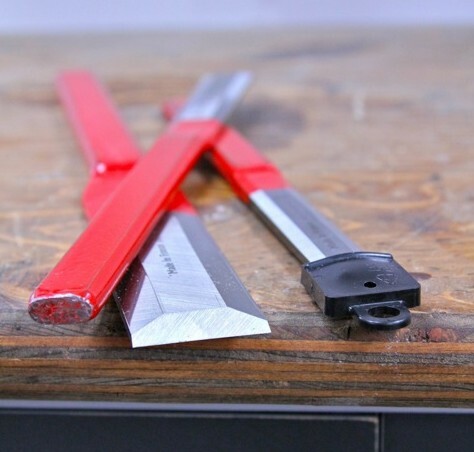 Although Kitec can be bent in a radius as tight as five times its diameter using a bender, it will kink if you try to bend it sharply by hand. Be careful. Kitec comes rolled in two colour-coded versions: blue for cold water and compressed air, and orange for cold and hot water. All sizes of Kitec can be cut using a pair of plastic-and-metal shears that slice the pipe more effectively than you’d think possible at first glance. A hand-held reamer removes burrs on the inside of the pipe that might otherwise damage the O-rings on the connector fittings. With the reamer on-hand you can also cut Kitec with a regular copper pipe cutter, saving you the cost of the shears. My greatest initial concern with Kitec is probably one you’ll have when you first see the product: flow rate through the fittings. Although sales literature claims it delivers a higher flow rate of water than copper pipe in a given size category, these specs don’t make mention of the effect that the Kitec fittings have on performance. Unlike fittings for copper pipe that fit over the outside of the joint, the flexible nature of Kitec means that fittings must extend both inside and outside the pipe. A 1/2-inch Kitec tee-fitting measures only a bit larger than 5/16-inch inside. And this reduced diameter extends over the entire 2 3/8-inch length of the fitting. The hole looks pretty puny. When I put this concern to my local Kitec dealer, he explained that proper installation strategy greatly reduces the need for fittings. In fact, you might not need to use any tee fittings at all. Instead of the usual plumbing approach involving branch lines sprouting off from a main line with tees, Kitec recommends something called the manifold system. A 1-inch diameter pipe feeds a central metal hub, from which sprouts a handful of smaller ports supplying individual 1/2-inch lines that go directly to the plumbing fixtures they feed. This eliminates the need for many fittings which is more than just a technical advantage. Since the DIY-friendly threaded fittings are costly (the 1/2-inch diameter tee lists at about $10 each), the manifold approach saves money, too. Contractors installing Kitec in production housing use a less expensive connection system of crimp-on fittings, and you can too, though it does require the purchase of a crimping tool that lists at $350.00. Call wholesale dealers and you should be able to get it for less. Would I consider Kitec for my home? Yes, but not because I believe it’s as vastly superior to copper as the sales literature maintains. Kitec’s ease of use means it’s somewhat quicker to install, and I believe manufacturer claims that state it won’t clog with scale and isn’t as prone to noisy water-hammer sounds. Where Kitec really shines for the do-it-yourselfer is in renovation work. Flexibility and freedom from soldering makes it easier to work with in tight quarters, especially where it’s difficult to use a torch without burning surrounding wood.